2:10 I think I'm going to call it a day, and pass on the last two trades. I just don't see much potential. Thanks for coming. See you next week. Take a course. middle of the night insomnia, so I'm sleep deprived. So considering how I feel, I'm OK with what I did do. 11:08 stopped for +3. My gamble failed, but at a profit. Taking a breakfast break now. 10:38 stop to 1228 -lock 2. Ordinarily, I would take a 9 point gain. Today's momentum tells me I may get much more. To judge the momentum, look at the MTRainbow chart. The dips have not even touche the 55 minute EXMA. 10:21 last night I posted a chart in the Certified Chaos Trader's Room showing the end of the 9 day congestion, using a congestion ellipse. 10:12 yesterday I used a technique taught in the Chaos Trading Made Easy course to estimate the potential of this rally. It came out 1250.25. We shall see. 9:31 outcry session now open. 110 minute EXMA up, now near 1219.82. Watching for the 20 EXMA to dip toward it. the risk of such moves going against you. You just have to be patient and get in when the conditons are right. 9:07 on the MTRainbow chart, the white 440 EXMA is up, so trend of the day is up. 10/21/2011 2:14:58 PM MT Tg****:: Al was right about the "N" pattern. 10/21/2011 11:24:26 AM MT BBB:: I gave away the keurig the second i tried one of these machines. It keeps beans in a little drawer and grinds them on its own, packs them, and spits out perfect espresso. The Keurig does not even compare. I love it too, but this thing is amazing. 10/21/2011 11:18:02 AM MT Tg****:: By my count this is a move 6 of 7 from yesterday's low though today's high did achieve about the minimum one would expect a completed up fractal to get to based on yesterday's rally off of the low. 10/21/2011 11:13:21 AM MT Tg****:: Good sized gap up day and a run to new multiday highs...on these sorts of days the 110 often won't be breached by more than a point so I can definitely see why one would try to let that run. Especially after having a very good overnight trade. 10/21/2011 11:08:46 AM MT BBB:: Al -- Jura espresso machine. Expensive, but the best I have ever had, better than that Starbucks place everyone talks about. 10/21/2011 10:28:19 AM MT srj****:: mm, Thanks (tells me where to focus), still familiarising my self with MT, the standing rules and the past clinics before I go "live". 10/21/2011 10:09:06 AM MT JMV****:: I'm having a hard time picturing a big up move towards the end of the session. So much "headline risk" today I don't see big money making huge commitments one way or the other... More than they have already, that is. 10/21/2011 10:05:29 AM MT BBB:: Think this is another runup, congestion, run up kind of day? 10/21/2011 9:46:05 AM MT srj****:: BTW guys Thanks, all the comments below are great for a newbie like me. 10/21/2011 9:13:57 AM MT JMV****:: Agreed. Sometimes if I feel like gambling I'll simply move my stop to my desired target and trail it from there instead of taking profits outright. I don't allow myself to gamble any more than that, but that's just a personal preference. 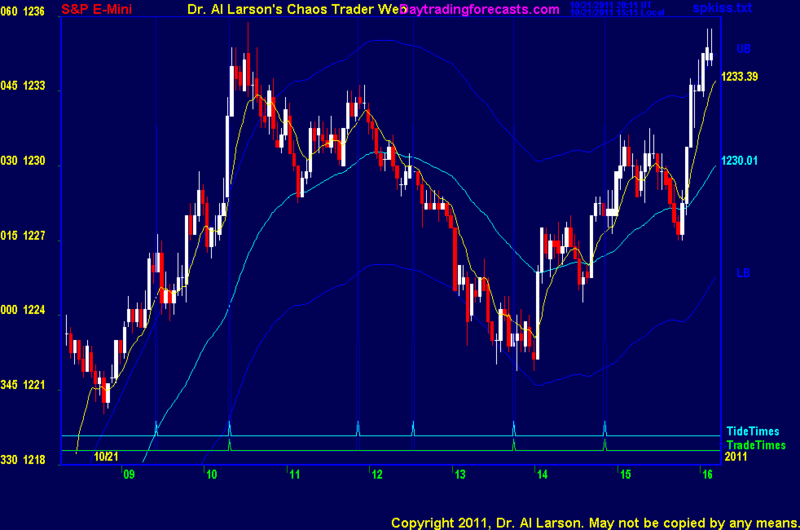 10/21/2011 9:09:57 AM MT AG:: With you on volatility targets - also use them. I suppose I'm referring to those special days when the art of trading comes in, but nothing beats discipline over the long term. 10/21/2011 8:58:23 AM MT JMV****:: In my own work I have found that having targets is more consistent if not profitable then just letting things run forever. Although I don't trade the ES much. It's always a good idea to set one's targets based on volatility, but with no targets whatsoever, sometimes you end up leaving quite a bit on the table. I daytrade trade mainly FX, and I know that 100 pips in one trade is spectacular, so that's my max target, if I hit it, I won't take my chances, I'll just take the money and run. 10/21/2011 8:45:43 AM MT AG:: What Dr. Larson is trying to do right now is exactly what I'm working on - 'really' letting your winners ride. One thing is to have a good day but another is to have a 'really' good day. Those outsized profits are what differentiate good traders from very good traders. 10/21/2011 8:22:57 AM MT Tg****:: understand, there was a 20/55 pinch and go and sometimes that's all you get in strongly trending market. 10/21/2011 8:15:00 AM MT Tg****:: On the 24 hour exmas, there was a nice 20/110 pinch and continuation just under 45 minutes prior to the 9:26 timeline. 10/21/2011 8:10:27 AM MT Tg****:: Al, I didn't see a 20/110 pinch. It was pinched to the upper out of band, though. 10/21/2011 7:39:04 AM MT mm****:: The MT look hot today - that 9:26 was right on the money. 10/21/2011 7:35:41 AM MT srj****:: gm all - beautiful day here N of Boston. 10/21/2011 6:39:53 AM MT EOE:: GM everyone. its another beautiful fall morning. good luck.